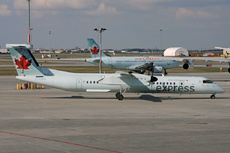 The DHC-8-400, operating as Sky Regional Airlines flight 7519, departed Montréal, Quebec, for a regularly scheduled flight to Billy Bishop Toronto City Airport, Ontario. During the landing, the aircraft touched down approximately 800 feet from the threshold of runway 26 but did not slow down in a timely manner. As the aircraft approached the end of the runway, the flight crew steered the aircraft toward the last taxiway to prevent an overrun. The aircraft came to a stop on the taxiway, shortly after exiting the runway. There were no injuries and no damage to the aircraft. During the landing roll, the flight crew did not adhere to the normal landing standard operating procedures (nosewheel de-rotation, position of power levers). In addition, only light braking was initially applied. As a result, the flight crew had difficulty slowing the aircraft in a timely manner and a runway overrun nearly occurred. If operators do not provide adequate simulator training for flight crews to recognize an unstable approach, then there is a risk that flight crews will continue an approach when it is unstable, which may lead to a landing incident. If flight crews operate directional control systems outside the manufacturer's recommendations, then there is a risk that difficulties in directional control may occur. If an air operator's safety management system does not include mandatory reporting of unstable approaches, then there is a risk that the practice will continue without being detected or monitored, which may increase the likelihood of an incident occurring.